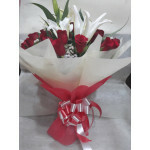 wrapped beautifully in a combination of red and white tissue with matching ribbon. Buy and deliver this exotic flower bouquet of red roses and white lilies anywhere in India on mother's day 2019 with Flowers n Emotions. Order Mother's day special bouquet at best price anywhere in India.